10 years ago we published a paper that delineated a distinction between the two components of long-term memory: stability and retrievability (Wozniak, Gorzelanczyk, Murakowski, 1995). The paper provided the first outline of the so-called S/R Model that makes it easier to build molecular models of long-term memory. Until now, the stability-retrievability distinction has not made a major impact on research in the field. Here we re-emphasize the importance of the S/R Model and sum up the findings of the last decade that refine the S/R Model and highlight its importance in the deconvolution of seemingly contradictory research in the field of memory and learning. 2. Why do we need two variables to describe long-term memory? These two intuitive interpretations of retrievability and stability will make it easier to develop further mathematical descriptions of changes in long-term memory variables over time depending on the rehearsal patterns (i.e. the timing of repetitions). We will use Eqns. (3.2) and (3.5) frequently throughout this article. It has been proposed in the 1980s, that properties of memory can be derived from the study of the events in the environment (Anderson&Schooler, 1991). The guiding light of this proposition is the intuition that memory should reflect probabilistic properties of the environment. Such a reflection is likely considering a relatively easy evolutionary adjustment of molecular memory properties targeted at optimum survival through maximizing the storage of useful information without abusing storage capacity. Interesting conclusions have been drawn, among others, from studying the patterns of occurrence of selected keywords in New York Times. If memory "strength" was to reflect the probability of a re-encounter with a given word, we might conclude that the forgetting, reflecting the decline in memory strength, would optimally be a power function of time (in contrast to the exponential nature of forgetting concluded or assumed in a majority of publications). Let us have a closer look at the New York Times example to illustrate how understanding of the distinction between retrievability and stability of memories could help us interpret Anderson's work. If we look at each memory episode as a Bernoulli trial, we can apply the binomial distribution to investigate the links between the episode frequency, re-occurrence interval, and the encounter probability. That would apply to the occurrence of words in New York Times as well. For a large number of trials and a low episode probability (here low keyword frequency), we can apply a Poisson distribution to approximate the binomial distribution and notice that Anderson's observation on the power relationship describing the probability of word re-occurrence in New York Times as a function of interval since the last occurrence must be correct. In other words, probability of re-occurrence is proportional to the reciprocal of the interval since the last occurrence. Seemingly, the power function would adequately reflect the probability of episode re-occurrence. Negative power curve would then seem a solid evolutionary candidate to reflect forgetting in a well-optimized memory system. However, Anderson, as most researchers then and now, rely on an ill-defined concept of memory strength. What if we make a clear-cut distinction between R and S. Which one, R or S, would reflect the probabilistic properties of the environment? R is a "delete timer", which measures the interval since the last occurrence of the stimulus evoking a memory that is to be consolidated. If the average occurrence rate is inversely proportional to the interval since the last occurrence, probability of recall should show a negative power decline. However, there seems to be no correlation between the occurrence rate and retrievability. After each encounter (or repetition), probability of recall climbs back to 1. This climb-back is independent of the actual frequency of the occurrence of the stimulus! Moreover, for recall proportional to 1/t, we would be approaching infinity as t approaches 0. Retrievability definitely does not reflect the probability of re-encounter with the stimulus. Retrievability is used by the memory system only to time out the lifespan of memory traces. This span is longer for more relevant (frequent) stimuli, but the forgetting curve expressing R is not a reflection of the probability of re-encounter. As we will argue later, the forgetting curve is negatively exponential in nature despite the expectation of it being a negative power function. For Pr approaching 0 we then have SInc approaching 2. This is precisely the intuitive increase in memory stability proposed for the first formulation of spaced repetition techniques that later evolved into SuperMemo. Also, for low values of Pr, and r>2, successive decline in the value of SInc mirrors the power decline of R-factors in SuperMemo. In conclusion, what Anderson proposed in reference to memory strength, should be addresses to memory stability, not to memory retrievability. Instead of investigating forgetting curves, we should measure and analyze memory stability in successive reviews. The finding that forgetting is exponential in nature should not undermine Anderson's postulates. However, a observation that partly unravels the simplified model presented above, and severs the straightforward connection between memory and environment is that of the spacing effect. Clearly memory refuses to view the stream of environmental stimuli as a Poisson process. It does not treat individual events as independent. Memory takes into account clustering of events in time. This is to prevent clusters of probabilistically dependent events being equivalent in memory stability-building power to a numerically equivalent stream of independent events. Andersons postulates are bound to be a solid guideline to understanding memory. The full elucidation of the link between environment and memory is a question of time. The S/R distinction should be monumentally helpful in avoiding confusion resulting from the superposition of the two properties of long-term memory. By employing SuperMemo, we can overcome all these obstacles to study the nature of memory decay. As a popular commercial application, SuperMemo provides virtually unlimited access to huge bodies of data collected from students all over the world. 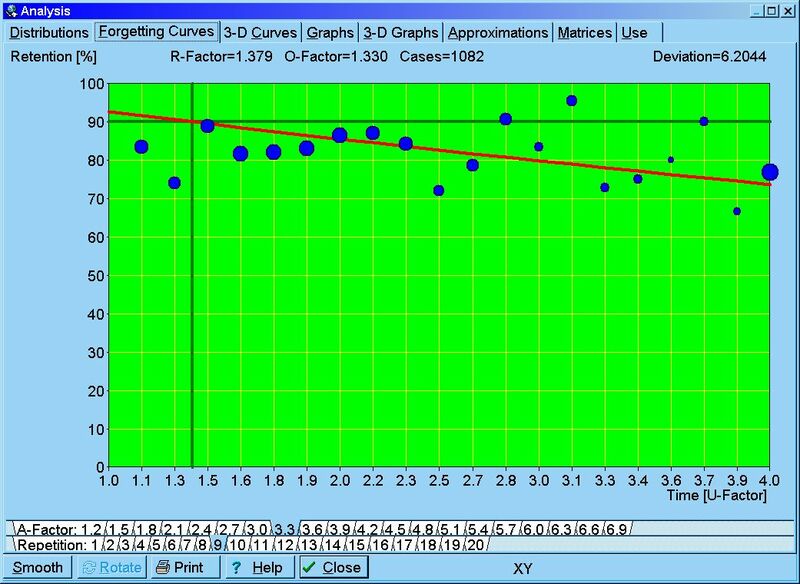 The forgetting curve graphs available to every user of the program (Tools : Statistics : Analysis : Forgetting curves) are plotted on relatively homogenic data samples and are bona fide reflection of memory decay in time (as opposed to other forms of learning curves). The quest for heterogeneity significantly affects the sample size though. It is important to note that the forgetting curves for material with different memory stability and different knowledge difficulty differ. Whereas memory stability affects the decay rate, heterogeneous learning material produces a superposition of individual forgetting curves each characterized by a different decay rate. Consequently, even in bodies with hundreds of thousands of individual pieces of information participating in the learning process, only relatively small homogenous samples of data can be filtered out. These samples rarely exceed several thousands of repetition cases. Even then, these bodies of data go far beyond sample quality available to researchers studying the properties of memory in controlled conditions. Yet the stochastic nature of forgetting, still makes it hard to make an ultimate stand on the mathematical nature of the decay function (see two examples below). Having analyzed several hundred thousands samples we have come closest yet to show that the forgetting is a form of exponential decay. Fig. 5.1. Exemplary forgetting curve sketched by SuperMemo. The database sample of nearly a million repetition cases have been sifted for average difficulty and low stability (A-Factor=3.9, S in [4,20]), resulting in 5850 repetition cases (less than 1% of the entire sample). The red line is a result of regression analysis with R=e-kt/S. 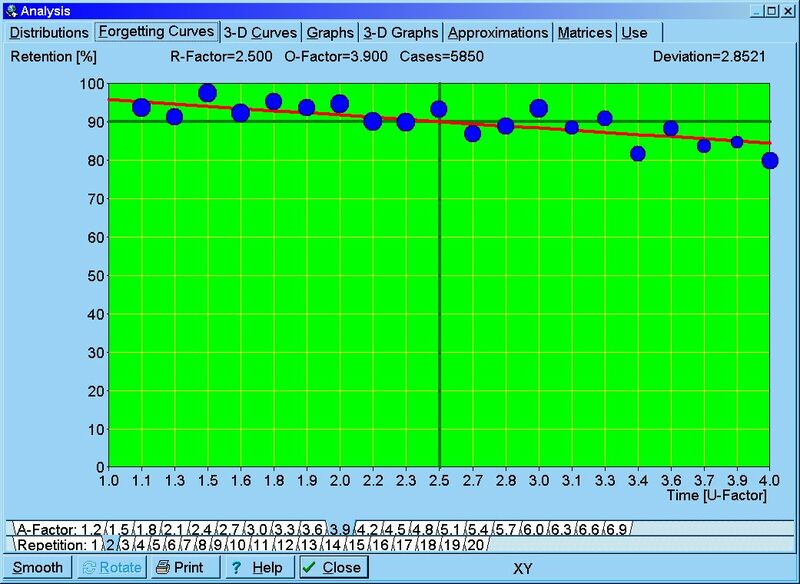 Curve fitting with other elementary functions demonstrates that the exponential decay provides the best match to data. The measure of time used in the graph is the so-called U-Factor defined as the quotient of the present and the previous inter-repetition interval. Note that the exponential decay in the range of R from 1 to 0.9 can plausibly be approximated with a straight line, which would not be the case had the decay been characterized by a power function. To illustrate the importance of homogenous samples in studying forgetting curves, let us see the effect of mixing difficult knowledge with easy knowledge on the shape of the forgetting curve. Fig. 5.3 shows why heterogeneous samples may lead to wrong conclusions about the nature of forgetting. The heterogeneous sample in this demonstration is best approximated with a power function! The fact that power curves emerge through averaging of exponential forgetting curves has earlier been reported by others (Anderson&Tweney 1997; Ritter&Schooler, 2002). Fig. 5.3. Superposition of forgetting curves may result in obscuring the exponential nature of forgetting. A theoretical sample of two types of memory traces has been composed: 50% of the traces in the sample with stability S=1 (thin yellow line) and 50% of the traces in the sample with stability S=40 (thin violet line). The superimposed forgetting curve will, naturally, exhibit retrievability R=0.5*Ra+0.5*Rb=0.5*(e-k*t+e-k*t/40). The forgetting curve of such a composite sample is shown in granular black in the graph. The thick blue line shows the exponential approximation (R2=0.895), and the thick red line shows the power approximation of the same curve (R2=0.974). In this case, it is the power function that provides the best match to data, even though the forgetting of sample subsets is negatively exponential. Until now, we have not been able to formulate a universal formula that would link a repetition with an increase in memory stability. Repetition spacing algorithms proposed by the authors (Wozniak, Gorzelanczyk, 1992) are based on a general understanding on how stability increases when so-called optimum inter-repetition intervals are used (defined as intervals that produce a known recall rate that usually exceeds 90%). The term optimum interval is used for interval's applicability in learning. The said repetition spacing algorithms also allow of determining an accurate stability increase function for optimum intervals in a matrix form. However, little has been known about the increase in stability for low retrievability levels (i.e. when intervals are not optimum). With data collected with the help of SuperMemo, we can now attempt to fill in this gap. Although SuperMemo has been designed to apply optimum intervals in learning, in real-life situations users are often forced to delay repetitions for various reasons (such as holiday, illness, etc.). This provides for a substantial dose of repetitions with lower retrievability in nearly every body of learning material. In addition, in 2002, SuperMemo introduced the concept of a mid-interval repetition that makes it possible to shorten inter-repetition intervals. Although the proportion of mid-interval repetitions in any body of data is very small, for sufficiently large data samples, the number of repetition cases with very low and very high retrievability should make it possible to generalize the finding on the increase in memory stability from the retrievability of 0.9 to the full retrievability range. To optimally build memory stability through learning, we need to know the function of optimum intervals, or, alternatively, the function of stability increase (SInc). These functions take three arguments: memory stability (S), memory retrievability (R) and difficulty of knowledge (D). Traditionally, SuperMemo has always focused on dimensions S and D, as keeping retrievability high is the chief criterion of the optimization procedure used in computing inter-repetition intervals. The focus on S and D was dictated by practical applications of the stability increase function. In the presented article, we focus on S and R, as we attempt to eliminate the D dimension by analyzing "pure knowledge", i.e. non-composite memory traces that characterize knowledge that is easy to learn. Eliminating the D dimension makes our theoretical divagations easier, and the conclusions can later be extended to composite memory traces and knowledge considered difficult to learn. In other words, as we move from practice to theory, we shift our interest from the (S,D) pair to the (S,R) pair. In line with this reasoning, all data sets investigated in this article have been filtered for item difficulty (in SuperMemo: A-factor ranging from 3.0 to 3.5 to balance a large number of items of knowledge versus a large number of repetitions). At the same time, we looked for possibly largest sets in which representation of items with low retrievability would be large enough as a result of delays in rehearsal (in violation of the optimum spacing of repetitions). Below we describe a two step procedure that was used to propose a symbolic formula for the increase in stability for different retrievability levels in data sets characterized by low and uniform difficulty (so called well-formulated knowledge data sets that are easy to retain in memory). Well-formulated and uniform learning material makes it easy to distill a pure process of long-term memory consolidation through rehearsal. As discussed elsewhere in this article, ill-formulated knowledge results in superposition of independent consolidation processes and is unsuitable for the presented analysis. Let us define a procedure for computing stability of memory for a given rehearsal pattern. This procedure can be used to compute stability on the basis of known grades scored in learning (practical variant) and to compute stability on the basis of repetition timing only (theoretical variant). The only difference between the two is that the practical variant allows of the correction of stability as a result of stochastic forgetting reflected by failing grades. Our goal is to find the function of stability increase for any valid level of R and S: SInc=f(R,S). Note that SuperMemo uses a first-interval graph to determine S1, which is progressively shorter after each failing grade. In the future, this more precise measure of S1 should be used for increased accuracy. This approach makes it possible to arrive at the same final SInc[R,S] independent of the original value of SInc[R,S] set at initialization. The application and the source code used to compute SInc[R,S] from repetition history data in SuperMemo is available from the authors upon request. In Step 2, we will use the SInc[R,S] matrix obtained here to obtain a symbolic formula for SInc. We can now use any gradient descent algorithm to evaluate symbolic candidates for SInc that provide the best fit to the matrix SInc derived above. The conclusion on the power dependence between SInc and S above confirms previous findings. In particular, the decline of R-Factors along repetition categories in SuperMemo has always been best approximated with a power function. When we look for the function reflecting the relationship of SInc and R for constant S, we see more noise in data due to the fact that SuperMemo provides far fewer hits at low R (its algorithm usually attempts to achieve R>0.9). Nevertheless, upon inspecting multiple data sets we have concluded that, somewhat surprisingly, SInc increases exponentially when R decreases (see later to show how this increase results in a nearly linear relationship between SInc and time). The magnitude of that increase is higher than expected, and should provide further evidence of the power of the spacing effect. That conclusion should have a major impact on learning strategies. Interestingly, stability increase for retrievability of 100% may be less than 1. Some molecular research indicates increased lability of memories at review time. This is one more piece of evidence that repetitive cramming can hurt you not only by costing you extra time. The parameters a, b, c, d would vary slightly for different data sets, and this might reflect user-knowledge interaction variability (i.e. different sets of learning material presented to different users may result in a different distribution of difficulty as well as with a different grading criteria that may all affect the ultimate measurement). For illustration, an average value of a, b, c, d taken from several data sets has been found to be: a=76, b=0.023, c=-0.031, d:=-2, with c varying little from set to set, and with a and d showing relatively higher variance. The above formula produced SInc values that differed on average by 15% from those obtained from data in the form of the SInc matrix on homogenous data sets (i.e. repetition history sets selected for: a single student, single type of knowledge, low difficulty, and a small range of A-Factors). The nearly linear dependence of SInc on time is reflected in SuperMemo by computing the new optimum interval by multiplying the O-Factor by the actually used inter-repetition interval, not by the previously computed optimum interval (in SuperMemo, O-Factors are entries of a two-dimensional matrix OF[S,D] that represent SInc for R=0.9). From Eqn (7.1) we have E(SInc)=(aS-b*ecR+d)*R. By finding the derivative dE(SInc)/dR, and equating it with zero, we can find retrievability that maximizes the expected increase in stability for various levels of stability. Figure 8.1. shows the graph of E(SInc) as a function of R for S<15. Using terminology known to users of SuperMemo, the maximum expected increase in memory stability for short intervals occurs for the forgetting index equal to 60%! This also means that the maximum forgetting index allowed in SuperMemo (20%) results in the expected increase in stability that is nearly 80% less than the maximum possible (if we were only ready to sacrifice high retention levels). Fig. 8.1. Expected increase in memory stability E(SInc) as a function of retrievability R for stability S<15. Both components of difficulty can be counteracted with the application of appropriate representation of knowledge in the learning process. Let us see how complexity of knowledge affects build up of memory stability. Imagine we would like to learn the following: Marie Sklodowska-Curie was a sole winner of the 1911 Nobel Prize for Chemistry. We can take two approaches: one in which knowledge is kept complex, and one with easy formulations. In a complex variant, a double cloze might have been formulated for the purpose of learning the name of Marie Curie and the year in which she received the Nobel Prize. We will use the Eqn. (9.4) if further analysis of composite memory traces. We might expect, that if initially, stability of memory subtraces Sa and Sb differs substantially, subsequent repetitions, optimized for maximizing S (i.e. with the criterion R=0.9) might worsen the stability of subcomponents due to sub-optimal timing of review. The next section shows this is not the case. We have seen earlier than R=exp(-k*t/S). If we generate a double-cloze, we are not really sure if a single repetition generates a uniform activation of both memory circuits responsible for storing the two distinct pieces of knowledge. Let us assume that the first repetition is the only differentiating factor for the two memory traces, and that the rest of the learning process proceeds along the formulas presented above. As can be seen in Fig. 10.1., memory stability for the composite trace will always be less than the stability for individual subtraces; however, the stabilities of subtraces converge. Fig. 10.1. Convergence of stability for memory sub-traces rehearsed with the same review pattern optimized for the entire composite memory trace (i.e. review occurs when the composite retrievability reaches 0.9). The horizontal axis represents the number of reviews, while the vertical axis shows the logarithm of stability. Blue and red lines correspond with the stability of two sub-traces which substantially differed in stability after the original learning. The black line corresponds with the composite stability (S=Sa*Sb/(Sa+Sb)). The disparity between Sa and Sb self-corrects if each review results in a uniform activation of the underlying synaptic structure. The above demonstrates that with the presented model, the increase in memory stability is independent of the complexity of knowledge assuming equal re-consolidation of memory subtraces. At the molecular level, the distinction between stability and retrievability of memory may help resolve seeming paradoxes in attempts to answer questions such as "Do ampakines improve memory?". If ampakines activate AMPA, they may increase retrievability, yet they might worsen conditions for unblocking NMDA and memory consolidation. Ampakines might paradoxically improve recall and worsen learning. The distinctions of the S/R Model are central for similar analyses. Most memory research deal with short time scales and would only produce R-relevant results. This emphasizes the importance of the S/R Model in disentangling experimental contradictions. Anderson, R. B. (1997). The power law as the emergent property. Bowling Green State University.